A superb meeting on May 13th,chaired by Andrew Thomson, illustrated the very best of the objectives pursued in the development of speaking in public: comprising of a wide range of subject matter, ranging from the mains water supply, in economically stressed Greece, to the beauty of a village church in England, via the French revolution. The fascinating content of the prepared speeches by Lisa Emms and Bernie Morgan, in turn, not only demonstrated their respective progress set by the club`s guide book, but provided entertainment for an audience of fellow members and visitors. Advancement is monitored by more experienced speakers by virtue of evaluation – constructive appraisal with appropriate advice for improvement: offerrred, in this instance-by Ian Lockyer and June Edwards respectively. 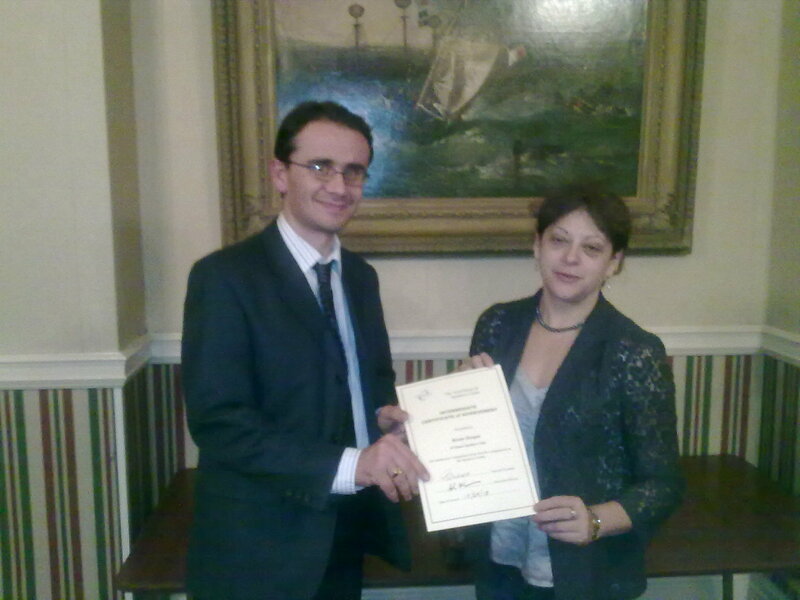 Bernie Morgan has now qualified for her intermediate certificate of achievement. The second half of the meeting continued with the same high standard, but on subject matter-topics-for which no time is given for preparation: impromptu speaking. Doug Weale set a challenging theme, to deliver an opposing opinion of established and well founded proverbs, which had stood the test of time. The speaking with authority, required in such a session, is vital to our objective, offering an opportunity to all present, including usual visitors: two of whom, Rohan Banerjee and Marco Gerghty,f rom Chatham House G.S., gave an impressive response to their topic. For the best response of all, judged by popular vote, the trophy was awarded to Trevor Kenning, who as a founder member of the club, took great delight in it`s presentation to him by Rohan,the previous winner. The ceremony highlighting the concomitance of novice and master in admiration of what the club has to offer. The meeting as a whole was,in the evaluation given by Bernie Morgan, of the high standard to which the club regularly aspires. This entry was posted in News and tagged Andrew Thomson, Ian Lockyer, in economically stressed Greece, Lisa Emms and Bernie Morgan, via the French revolution on May 23, 2010 by admin. The meeting on March 25th, chaired by June Edwards, accentuated the tremendous progress of recently enrolled members: Frances Pointer, Kathleen Smith and the club`s newest and youngest member, Ben Harris, each in turn fulfilled challenging assignments putting into practice their skills, aquired by membership,in the art of speaking in public, which the club promotes. Firstly, Frances delivered a most entertaing speech, requiring the ability to speak with conviction on a chosen subject. The Education Director, Andrew Thomson, had, as custom decrees, assigned an experienced member to give a constructive evaluation: in doing so, Trevor Kenning drew attention to the ideal choice of subject, upon which the speaker ably expounded,and gave helpful advice on further progress. Kathleen Smith followed with a most perceptive evaluation of a speech from the advanced manual by a long standing club member; her confidence and authority in adressing this assignment so early in her career with the club, was evidence of the learning process. The impromptu speaking session in the second half was chaired by the versatile Andrew Thomson was a further example of the aquisition, so readily gained, by Ben Harris, of the skills on offer by the Association of Speakers Clubs. Doug Weale, in his appraisal of the Agenda paid tribute to the educational value, and the contribution to a successful meeting, by all present. This entry was posted in News and tagged Andrew Thomson, Association of Speakers Clubs, Education Director, June Edwards on March 28, 2010 by admin.